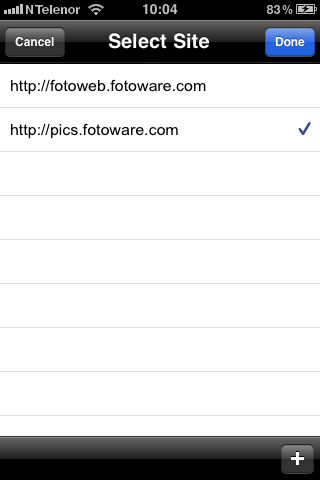 Once FotoWeb Desktop for iPhone has been initialized and configured for the first time, it will store the server host name you specified so you won’t have to type it again the next time you connect. If, however, you would like to connect to another FotoWeb server, you can easily change the connection. Tap the + icon to create another site connection. Now change the Host name to the new server you want to connect to. You must also specify a user name and password for authentication. Click Done to store the new site. When the connection is created, it will also be set as the active connection. To connect to one of the other sites you have created, simply tap it in the server list and then click on Done to store the changes.